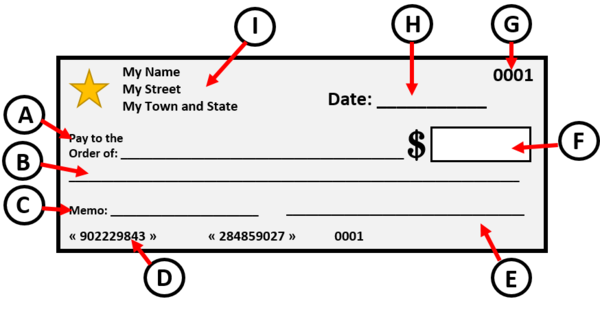 Use the check to answer the questions. Which letter provides you with the address of the person writing the check? On which line will you write the payee's name? On which line will you write October 5, 2015? On which line would you write the phrase "thirty-seven dollars"? Which letter represents the check number? Which letter represents the bank account number? Where would you write $37.00? Where do you sign the check? Where do you write additional information a company might need to process your check? You are writing a check to the grocery store. On which line will you write the name of the grocery store?